With the memories of our recent trip to Isla del Encanto or the Island of Enchantment still fresh in my mind, I gladly deliver the second installment. Last time, I chronicled my visit with my public relations friend Carlos Rivera, APR. As promised, this post will be somewhat of a travelogue, including cell camera photos taken along with observations during our all-too-short vacation. Actually, The PRDude has used this space a few times before to present thoughts and pictures during travels. Last December, I wrote about a nice weekend in Wisconsin visiting friends, reliving memories of my childhood and strolling the scenic resort town of Lake Geneva. In September of 2011, I shared thoughts and insight on my second favorite city in the world, New York. And, I provided a snapshot of my Chicago neighborhood, Logan Square, following a stroll through our farmer’s market and an art show during a hot Sunday last July. Note to travel editors: If you like what you see and read, I’m ready to talk, especially if you need a piece on Hawaii, Paris or Rio. Without further ado, some images and insight in and around San Juan, Puerto Rico. 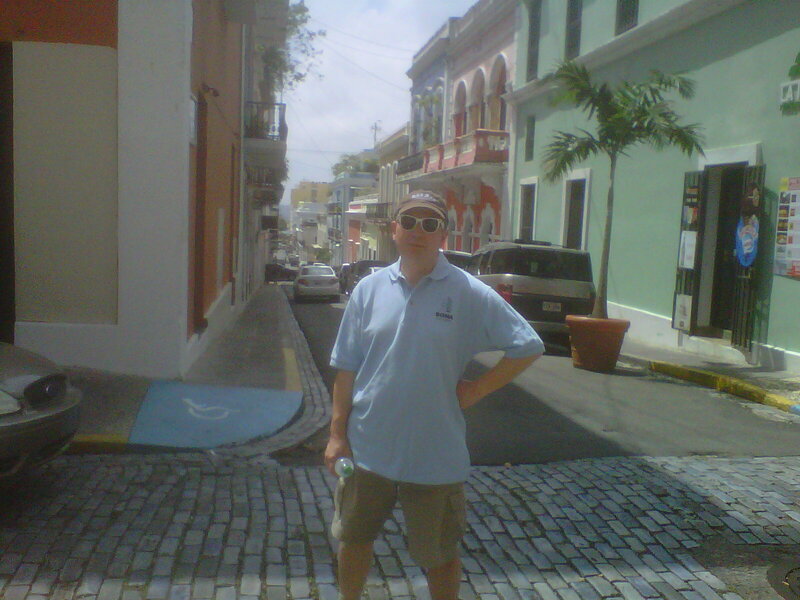 On a cobblestone street in Old San Juan. We loved the pastel buildings tucked side-by-side in the narrow streets. The cobblestones have a cool bluish tint. One wonders how many horses, cars and people traversed these thoroughfares the past 400 or so years. 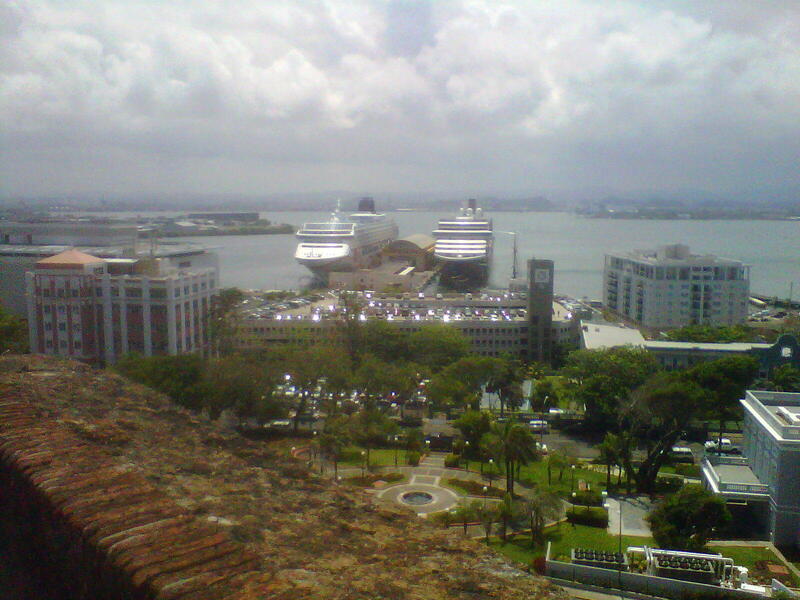 View of the harbor with cruise ships. 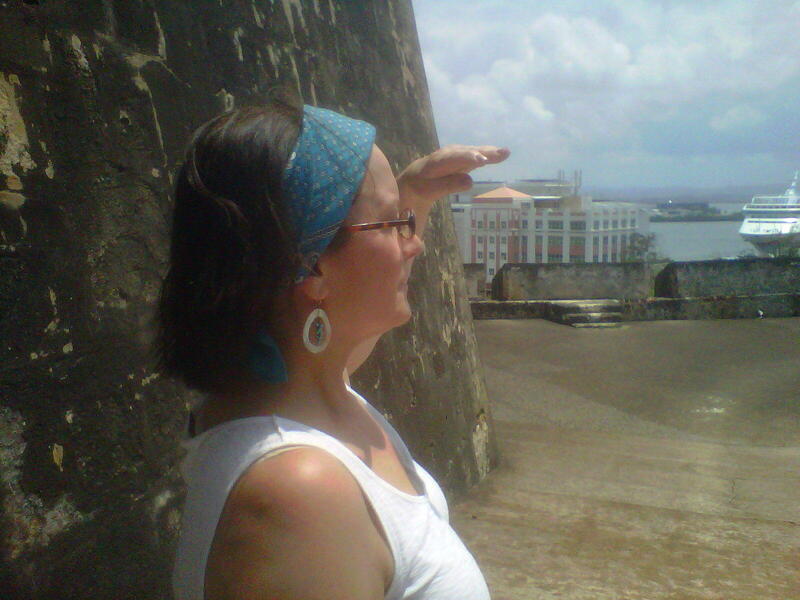 San Juan was a natural place for the Spanish to fortify because of its deep natural harbor and towering bluffs. From one of the old forts, I took this shot showing the kind of ships that sail into the port today. Me and a true artist. 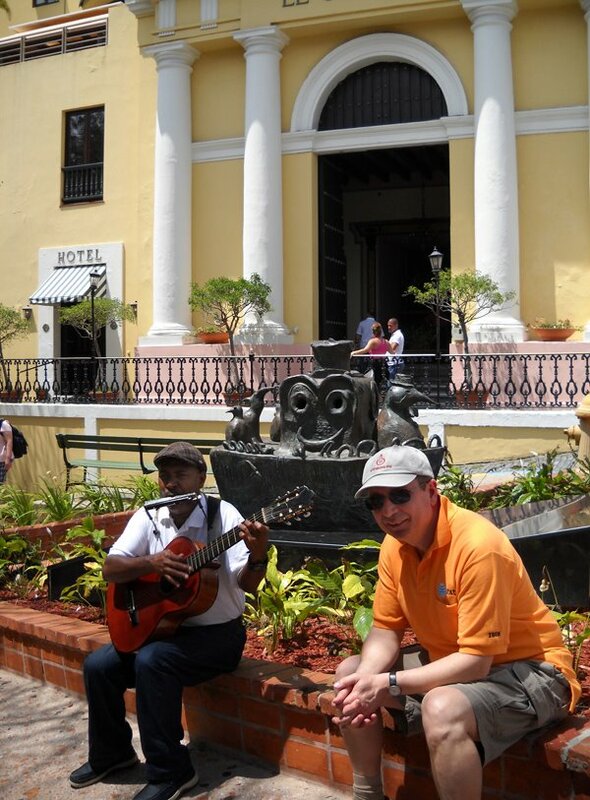 In the small plaza outside our hotel, Susan snapped this shot of me with an outstanding Puerto Rican musician. I've played guitar and harmonica and sang in bands for decades. Someday, I hope to be able to deliver a fraction of the soul and artistry this humble man delivered playing for tips. A day at the beach. The Atlantic Ocean was a short cab ride from our hotel room. 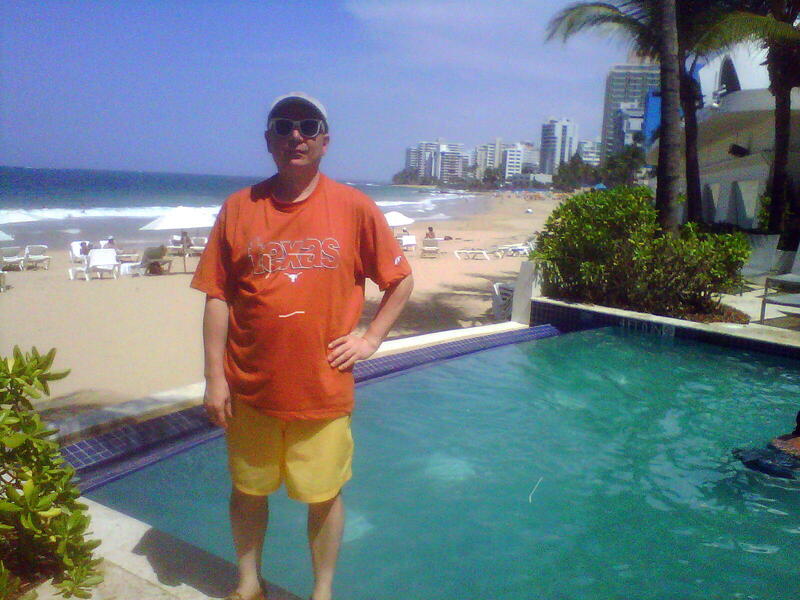 We spent a great afternoon sunning at a sister property and got to see modern San Juan. Lots of nice new hotels, some fine beaches and still lots of local character. Yes, there were T-shirt shops and tourist hang outs, but more restrained and colorful than we anticipated. Keeping the faith. On our last night, we heard music coming from the old cathedral across from our hotel. Upon venturing out, we came across a procession of the faithful complete with musicians, the Knights of Columbus and men carrying a large statue of the Virgin Mary. 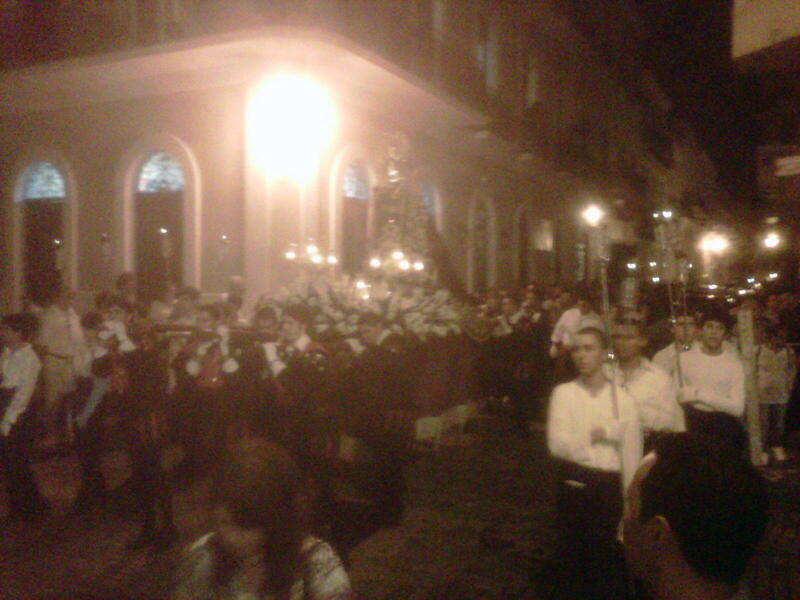 The procession wound its way to various churches in Old San Juan. We were touched by the devotion displayed by these people. Looking out to sea. I captured Susan on one of the old fortifications looking out over the water. Visiting the two forts, San Felipe del Morro and San Cristobal, is a must stop for visitors. These are UNESCO World Heritage Sites, cool beyond belief to tour and cost just $5! 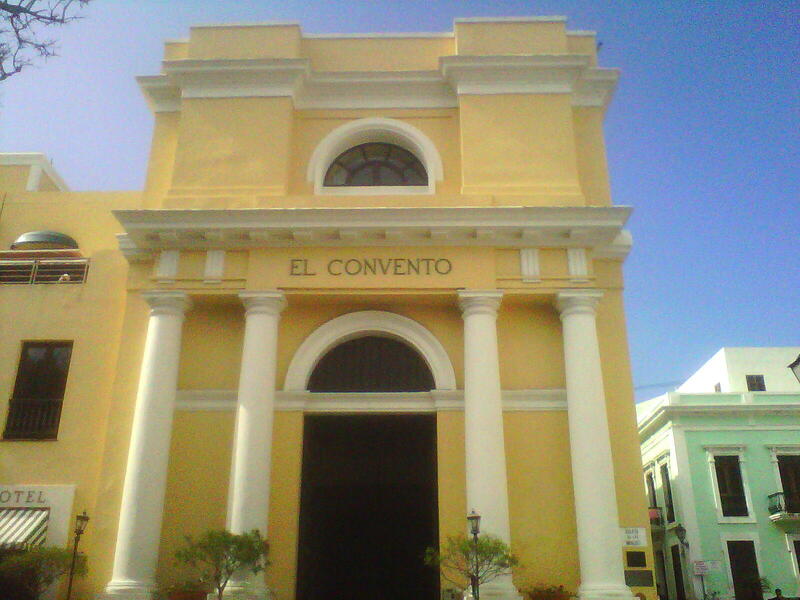 El Convento. Our hotel was a true highlight of the trip. The building originally built as a convent, then expanded and converted to a boutique hotel 100 or so years ago. Lots of charm and character, quite terraces, great views of the harbor and a magnet to an international crowd. We felt we truly were away from home at the El Convento. Promote the fact that U.S. citizens can travel to a Caribbean island without a passport and without having to change money. The Puerto Rican people are a cultural gumbo of the Spanish, Africans brought in slavery and native Taino peoples. Communicate this in the same way New Orleans promotes its French Creole heritage. Point out the lesser-known cities of Mayaguez and Ponce on the Caribbean side. My friend Carlos said these cities are just as historic and cool as San Juan, only not as big. Now it’s your turn: Have you visited Puerto Rico? Share your thoughts on this Caribbean commonwealth. This entry was posted in Uncategorized and tagged Caribbean, PR, public relations, Puerto Rican culture, Puerto Rico, San Juan, Spanish forts in Puerto Rico, vacation in Puerto Rico. Bookmark the permalink.